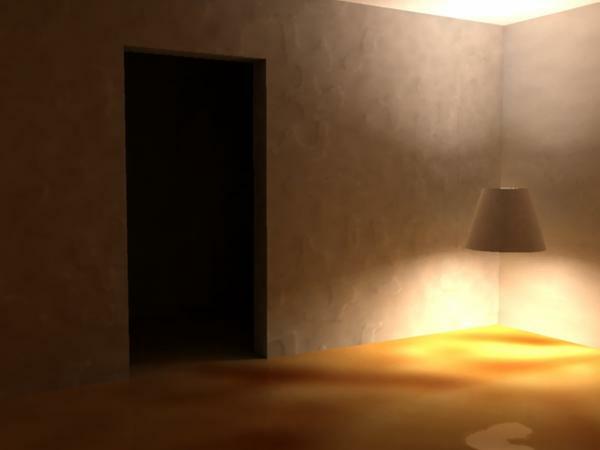 If you're trying to realistically light an interior room why wouldn't you consider setting the lights up realistically as well. In most cases that wouldn't be spotlights.. Okay, so all of this discussion of lampshades and spotlights and translucency and frosted glass comes down to your belief that you should model your lights realistically? Umm, okay, guess nobody can argue with that. I'm scratching my head trying to figure out what that has to do with the topic we're discussing (y'know, radiosity and what everyone is calling "color bleed"), but I'm sure all of the scientists here can sort that out. Where can i adjust it then? Are you talking about how deep black the shadows are, or something else? because to me, it looks like it's behaving as it should. The light doesn't cast a shadow, something blocking the light casts the shadow, just as in real life. If you're talking about the edges of the cube defining the shadow on the shaded side of the cube, that's to do with the sharp edges. If the blur in the second picture is to strong, lower the radius of the light. All I get when using soft shadows is this (see pic). AHHH, okay, when you said "sharp transitions" you didn't mean "cast shadows" ? 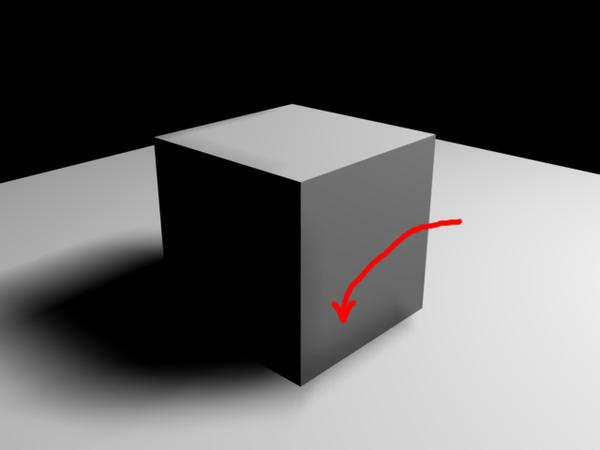 The reason why the cube in your example has a black, unlit side is because there is no light there. And as a scientist you know that light only travels in straight lines, so there's no way your directional light source could illuminate that back area on its own. There would have to be either another light source, or light bouncing around the scene for some reason. That's not the job of the single light source in your scene, though. 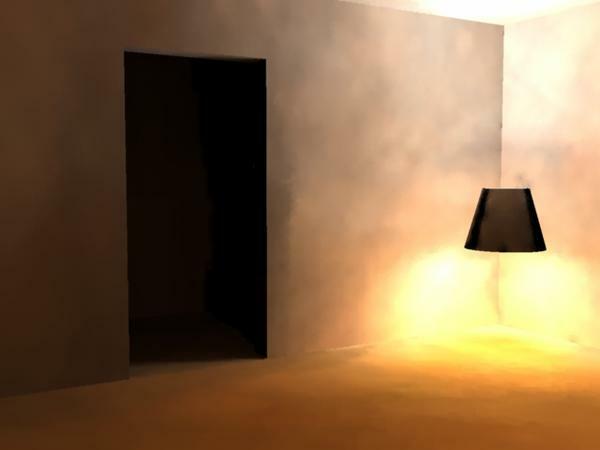 It's the job of either a radiosity simulator, or the artist who places a simulated bounced light source behind the cube so that light bounces into that area and provides some illumination. Which is why when people "fake GI" they add not only a main light source (or multiple primary light sources), but the also add bounce light sources to simulate the light from those primary lights bouncing on the walls, floors, etc. It has a lot to do with it. I'm currently rendering a scene with a translucent sphere around a bulb light. The room walls are white, the ceiling is white and the floor is a reflective brown color. So far the render doesn't have all the reflected color bleed that the OP was concerned about. So if this works to mitigate the color bleed, then my point about trying to mimic real world lighting in a simulation that tries to mimic real world light bounce is correct at least on a basic level. Is that enough on topic for you? The top surface of the cube is the brightest, then the right and then the back. The light on one surface is pretty evenly distributed though and each surface is lit differently, hence creating the "harsh transitions" i was talking about. Is there a setting for soft shadows that can soften the difference in intensity between the surfaces of the cube? Relating to Holly's render, is there a setting she can turn on/off in the soft shadows to reduce the "harsh transitions", or does she need to add more lights to do that? So if this works to mitigate the color bleed, then my point about trying to mimic real world lighting in a simulation that tries to mimic real world light bounce is correct at least on a basic level. Is that enough on topic for you? Yes, of course, if 80% of the room is illuminated by direct white light from a bulb, and 20% is by bounced light off a colored floor, then obviously the room illumination will have less color than if all of the room illumination is from colored bounce light off the floor. If that's an important revelation for discussion, then I'll stand aside. I figured it was obvious. Maybe not. I think you have a basic mis-understanding about light and how it travels, as well as materials and surfaces and how they interact with light. If a uniform, directed light beam illuminates a surface (eg, a side of your cube), then that entire surface will have that same level illumination. Try it sometime in a dark room with a bright and uniform flashlight. 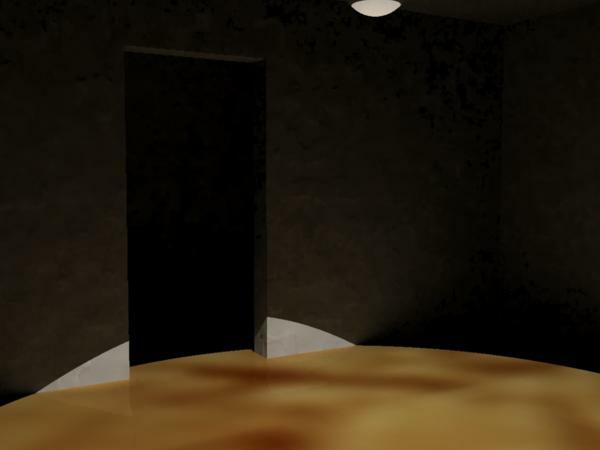 The spotlight in your scene is perfectly uniform, the surfaces on your cube are perfectly uniform, there is no bounce light in the scene, and there are no other shadows or objects to cast shadows on the cube. The only way you can get a variation in illumination on any surface is if something causes it. Either your light source becomes non-uniform or something else in the scene causes some variation. Here's some test renders I did. The IL was set to it's default. For this series, I placed a sphere with white, translucent shader over both a spotlight and bulb light. I rendered a version for each with the sphere and without the sphere. The first image is with the spotlight and no sphere. The second is the spotlight with the sphere. The third is the bulb with no sphere and the fourth is the bulb with the sphere. Edited to add that I used soft shadows on the light with light radius of .5 ft. Shadow buffers are meant to mimic raytraced soft shadows. They're designed for speed. 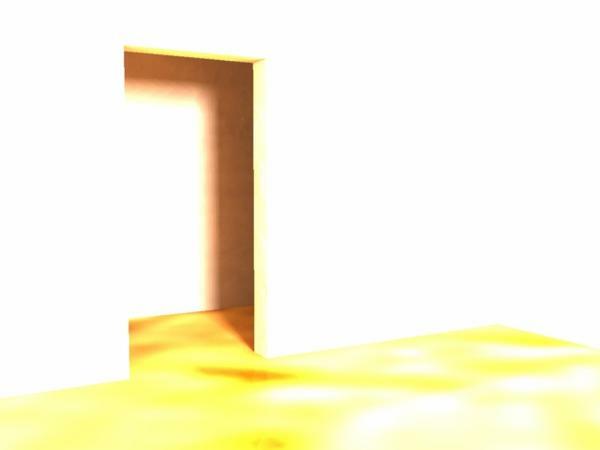 All things being equal, raytraced soft shadows are more accurate. Shadow buffers can be can be useful, but there are a bunch of caveats, some of which Holly mentioned. And yet everybody kept talking about spotlights and no other light types except Holly in her example. So yeah, maybe it was obvious, just not to everybody. As far as I know the difference in intensity between the surfaces of the cubes comes from the angle they make with the light beam. The top of the cube has the largest angle (closest to 90°), hence the light is spread over a smaller area resuling in a brighter side, no? I did, but everyone missed it...or fell asleep while I was banging on about other stuff. Nothing is too obvious to mention. That's at the heart of many moments of revelation. Sorry I missed it RoguePilot. I was skimming the thread at first. "The top surface of the cube is the brightest, then the right and then the back. The light on one surface is pretty evenly distributed though and each surface is lit differently, hence creating the “harsh transitions” i was talking about." Now you're talking about "smooth gradients" on the surfaces? Like I said, you won't get smooth gradients on a surface unless the surface is not flat (y'know, like a sphere), or there is something else to cause the gradients. Honestly I have no clue what you're trying to get. 1. Use soft shadows on all of my lights. 3. Don't use any radiosity or GI or anything like that. 4. Decide where the greatest amount of bounce light would originate from in the scene, and stick wide angle spots there with the right color, soft shadows, falloff, and a low intensity (maybe 30% or something like that). 5. Where my surfaces look uninteresting, I would spend a lot of time fixing the shaders to add interest. And I would also modify the mesh of the model as necessary to give the surfaces more interest (curve, etc.). Personally, I think that would give the image more interest and realism and impact. And all of that would be designed in line with the main theme and purpose I had for the image (suspense, horror, or whatever). So here's a test I did with making a lamp shade and using the same shader I used on my sphere in the previous set of images. The light settings are the same as well as the shader. Just the position is different and the geometry of the shade of course. Y'know, maybe somebody was right and my contribution to this discussion was irrelevant. 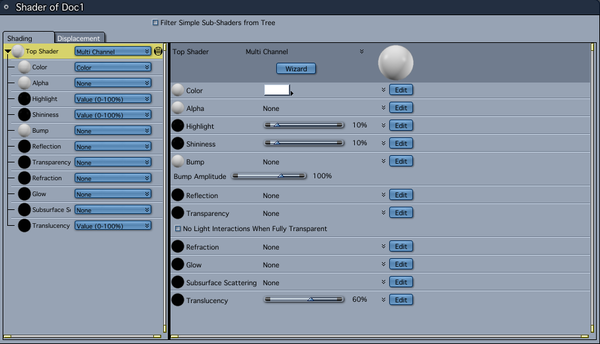 I'll also post my shader to show how simple it is. Are you talking about falloff there rather than shadowing? We often visualise a cube as getting darker as it goes back and that's a sketch artists trick to simulate depth. Try setting the distance setting of your light to about room size (7ft?) and max the falloff to 100%. Better yet use an IES profile. Or do you mean that each side gets a different amount of light? On Hollys scene, curved surfaces are much easier to work with and give more subtle shading. Giving a cube a bevelled edge will help in a similar way. When I do interiors I match lights their real world positions and start working from there. just a touch of ambient to lighten the shadows and ambient occlusion to darken them in the right place. Not sure if I can help any but I'd like to chime in. I read where someone in this thread described light bouncing within a closed room, that the room fills with light indefinitely. This could be true, but thermodynamically it should not be so. In a closed room made of walls that are perfect silvery mirrors, then yes, the room will continually fill. But if the walls are white or any color at all other than perfect silver, the photons will instead be absorbed....eventually. With each bounce the photon should lose some of its energy until it is all converted to heat or at least to ranges too red shifted to be visible. All basic black-body radiation stuff from high school. If photons in Carrara do not lose energy with each bounce then something is very wrong. Carrara's color bleed is generally quite excessive, I have noticed this myself in many instances. I do not think there is a real fix anywhere within the application. One of the things Holly has correctly eluded to is that the Carrara engine is biased, it takes shortcuts to speed rendering and this scene could be a good example of a time saving cheat that looks fine in most situations but fails in certain others. Holly is also correct in my view with her suggestion that faking the GI might prove more useful than the software implementation. As she demonstrated, a skilled user can accomplish very similar results with much less render time though the set up time is much greater. My suggestion would be to use material saturations of 75% maximum with an average range of about 40-60. Excessive saturation will lead to excessive color bleed. In real life nothing is 100% saturated anyhow. Also, careful with over-exposure due to overly bright direct (key) light sources, as this too drives up the intensity of the color bleed. Here's what Carrara is doing wrong. When the white light from the spotlight strikes the floor, a purple colored ray is fired toward one of the walls due to the floor color. When this purple photon leaves the floor it then strikes the first wall it sees and "bounces" on to another wall after that. But one would assume that when the original purple photon struck the white wall, that some of its brightness and some of it color saturation were both absorbed by the wall. The subsequent "bounced" photon should be reduced in both brightness and saturation in comparison with the original purple photon. But alas, Carrara doesnt allow color to be absorbed, only light intensity. So the result is that the bounced photon though dimmer is just as purple after bouncing off the first white wall and will continue to carry that same level of purpleness to every other surface it strikes leading to highly excessive color bleeding especially in a white room. I could be wrong in my assumption, but I notice in the original post that the indirect light intensity behaves differently than the indirect color bleed. In a room with colored or patterned walls this disconnect between brightness value and color saturation handling by the GI becomes much less obvious. Im guessing it would be the 'Global Illumination' in multi-pass, but I haven't tested with that yet. It should work well for post editing in other programs. Im just suggesting IR maps to stay within Carrara for testing since after an irradiance map is saved, the next time you use the map for the render, it will be a fraction of having to recalculate lighting the scene. All said, it might be a matter of preference for post editing or other. Hope this helps. But alas, Carrara doesnt allow color to be absorbed, only light intensity. . 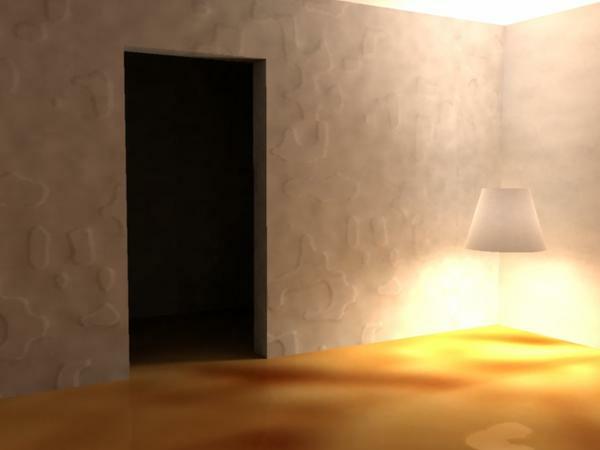 I suppose someone could fire up Blender or whatever and render two identical scenes using radiosity and see if there's a difference in results. Is the photon map the same as the IR map? I had always assumed they were. Here's what I get when I enable Show Photon Map. Well, Blender uses an "approximate GI" which is clearly biased, but in which ways it has been biased it is impossible to tell without some study. The best approach would be to render the scene in Lux or Octane which are unbiased, to see how closely the results match those of Carrara. Bias is a tricky thing and it often leads me to major discussions about why Carrara renders though great looking, arent anywhere close to unbiased renders. It has less to do with the finished result looking natural and much more to do with the process of getting to the result in the first place. It should also be reminded, that Radiosity itself is biased on the theoretical level and is not on its own considered accurate rendering. Radiosity cannot take specular into account as well as other light pathways (types of light other than direct diffuse illumination). Therefore, radiosity no matter how well implemented is still an incomplete solution. Still, I think the Carrara engine is outstanding. Yummy. Have you tried blender Cycles yet. That looks to be coming along well. As far as I know, the IR map is just a GI lighting solution saved as a map for the entire scene. So after you save a IR map, as long as only the camera moves it should be the same map from any angles. No recalculation for lighting(huge time saver). However if you move any of the scene objects without resaving a new map for the changes, then the lighting for those objects will no longer match(bad shadows etc.). So trees with moving leaves or charactor animations won't look right, only still scene objects will. For the Photon map, I think(correct if wrong) its just a view of how and where photon(s) are interacting within the scene. Used for adjusting the lighting with regard to camera positions and objects scales etc. Well, Blender uses an "approximate GI" which is clearly biased, but in which ways it has been biased it is impossible to tell without some study. The best approach would be to render the scene in Lux or Octane which are unbiased, to see how closely the results match those of Carrara..
Carrara is a biased renderer, no? And I was thinking that in order to prove/disprove whether Carrara's radiosity solution had an error (or whatever you want to call it) like you and others suggest, someone should do an identical render in a similar biased renderer and see if the results have the "color bleed". And even assuming they are different renderers, it should provide at least some basis for comparison. I'd think an unbiased renderer (Lux, Octane, whatever) would be far too different in terms of rendering and materials (physically based vs. not) to make a reasonable comparison. You're right, very sorry about that. Due to various circumstances I've developed some issues with... let's say anger management. I am lazy, this is true. However there are also differing goals and priorities to consider. The renders you posted as examples of GI and a light rig without GI illustrates this nicely. I prefer the GI version because... it's a matter of taste I suppose. Not that there's anything wrong with the other; it's just a style I don't care for. This being the case, I'm very much partial to approaches in which the computer does the heavy lifting, because it's just so much better at it than I could ever be. Good lighting takes talent and skill even with GI or an unbiased renderer like Lux, but it removes a lot of the annoying futzing about with stuff that should happen naturally as a consequence of properly behaving (i.e. bouncing) light when one of the goals is realistic lighting. But again apologies to everyone, especially to holly. I lost my temper there for no good reason really, and she certainly didn't deserve it. It wasn't mostly about anything she said anyway, just the last drop that caused an overflow.